Two new surface science laboratories have been established at PPPL to study plasma-surface interactions. The Surface Science and Technology Laboratory (SSTL) is located in T260 C-Site and contains three surface analysis systems and an ultrahigh vacuum (UHV) deposition chamber. The Surface Imaging and Microanalysis Laboratory (SIML) is located in C123 C-site and contains a scanning Auger microprobe (SAM). Experiments in these laboratories will facilitate a deeper understanding of plasma-surface interactions and provide a technical basis for the development and optimization of novel plasma facing components and wall conditioning based on liquid metals. Explore the topics below for details about the surface analysis capabilities of SSTL and SIML. This instrument combines multiple surface analysis techniques with metal deposition and gas/atom/ion dosing capabilities. 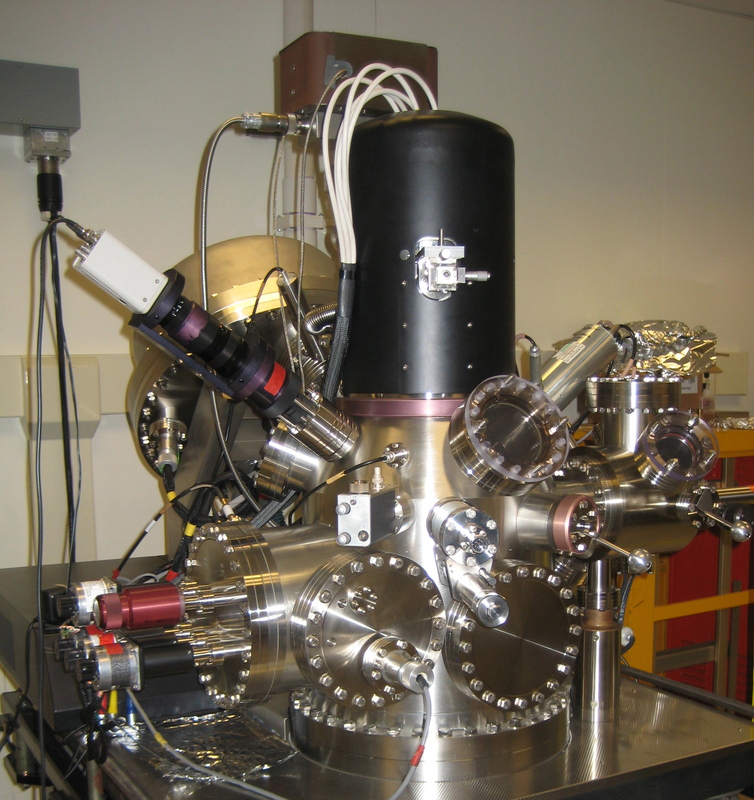 The three-level ultrahigh vacuum (UHV) chamber combines Auger electron spectroscopy (AES), X-ray photoelectron spectroscopy (XPS), UV photoelectron spectroscopy (UPS), low-energy electron diffraction (LEED), high-resolution electron energy loss spectroscopy (HREELS), and temperature-programmed desorption (TPD) mass spectrometry capabilities. HREELS is used to probe both optical and vibrational excitations on surfaces. These experiments are performed using a LK-2000 HREELS spectrometer with an electron energy resolution of 3 meV (28 cm-1). This spectrometer can continuously vary the incident electron beam energy enabling energy loss studies over a wide range, from 0-190 eV. The chamber has capabilities for vapor deposition of metal films (e.g. Li, Pt, Cu, Au) on substrates that can be heated and cooled from 85 to 1600 K using liquid nitrogen cooling and resistive and electron-beam heating. Gas dosing can be performed through precision leak valves and collimated beam dosers. Also available is an H-atom beam and a methyl-radical source. TPD experiments utilize a UTI 100C quadrupole mass spectrometer. This instrument is further described here. This instrument probes the atomistic, geometric structure of surfaces and adsorbed layers and has a unique capability to detect hydrogen absorbed on a surface. It utilizes angle-resolved alkali ion-scattering spectroscopy (ALISS) and angle-resolved XPS to detect forward-scattering or scanned-angle X-ray photoelectron diffraction (XPD). This instrument is a two-level ultrahigh vacuum (UHV) chamber with a rotatable ion analyzer for forward scattering (sensitive to adsorbed H) and nearly direct backscattering of rare gas and alkali ions from a differentially pumped Colutron 10-kV ion gun. An additional Perkin-Elmer Model 10-360 spherical capacitor analyzer with multichannel detection (MCD) for a 16-fold enhancement in the signal is used for impact collision ion scattering spectroscopy (ICISS) and angle-resolved XPS. The sample is mounted on a stage with computer/stepping motor control of polar and azimuthal angles. The chamber also includes capabilities for AES, UPS, XPS, LEED, and TPD. 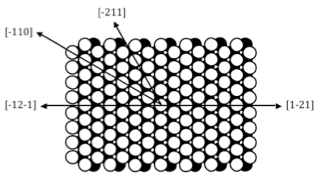 Schematic of a Pt(111) crystal. This instrument has rapid sample introduction "load-lock" capability and can quickly obtain surface information on a wide range of technical samples. The instrument has a dual anode (Al, Mg) X-ray source for X-ray photoelectron spectroscopy (XPS) and has been modified to include low energy ion scattering (LEIS) and reflection high-energy electron diffraction (RHEED) capabilities for thin film growth studies. XPS is routinely used for surface elemental quantification to 0.1 atom % and the identification of chemical oxidation states. Because of its non-destructive nature, XPS is a powerful technique for compositional analysis and, when used in an angle-resolved mode with or without Ar+ ion sputtering, is capable of rendering compositional depth-profiles and moderate film thickness measurements. The Microlab 310-F has the capability of micro- and nano-scale imaging of specific elements on a surface. It uses a field emission electron source for scanning electron microscope (SEM) and a hemispherical electron energy analyzer for scanning Auger microscopy (SAM), enabling elemental analysis of surfaces with a lateral resolution of 30 nm. The instrument has a rapid sample introduction "load-lock" capability, and a special reaction antechamber is being designed at PPPL to process samples at higher pressures and expose samples to more robust plasma environments for SAM measurements. This instrument is currently undergoing an upgrade to enable simultaneous X-ray photoelectron spectroscopy (XPS) and imaging measurements. 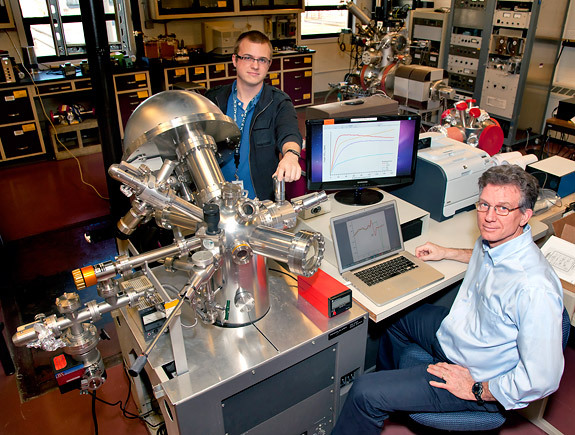 Prof. Koel also supervises laboratories with equipment and instrumentation for materials characterization and surface chemistry experiments on the Princeton Universty main campus. The Laboratory for Surface Chemistry (LSC) is located in Rm. J111 in the Engineering Quadrangle at Princeton University and contains five UHV chambers and associated instrumentation with additional capability for Fourier-transform infrared (FTIR) spectroscopy. Some of these chambers have attached microreactors that can operate at atmospheric pressure and are directly accessible via a sample transfer rod. Vibrational spectra at surfaces using FTIR (infrared reflection absorption spectroscopy (IRAS) or infrared transmission absorption spectroscopy (ITAS)) can be obtained with the sample under UHV conditions or at higher pressures. Atomic resolution imaging of surfaces by scanning tunneling microscopy (STM) can be carried out using our UHV variable temperature-STM (VT-STM) instrument, based on an RHK7000 system, with XPS, LEIS, UPS, LEED, and TPD capabilities. A new apparatus is under construction that combines HR-XPS, LEIS, and HREELS. This instrument includes state-of-the-art capability for surface characterization using a 270-mm-diameter VG Scienta R3000 XPS/UPS/ARPES hemispherical analyzer with a CCD-MCP detector and a 7-crystal, 650-W MX-650 monochromatic X-ray source for HR-XPS, and an LK ELS5000-MCA multichannel HREELS spectrometer for measuring vibrational and optical excitations with about 100-150 times the detection efficiency over conventional instruments, allowing for complete spectra to be acquired in a few seconds to minutes while maintaining high resolution of 1 meV (8 cm-1). 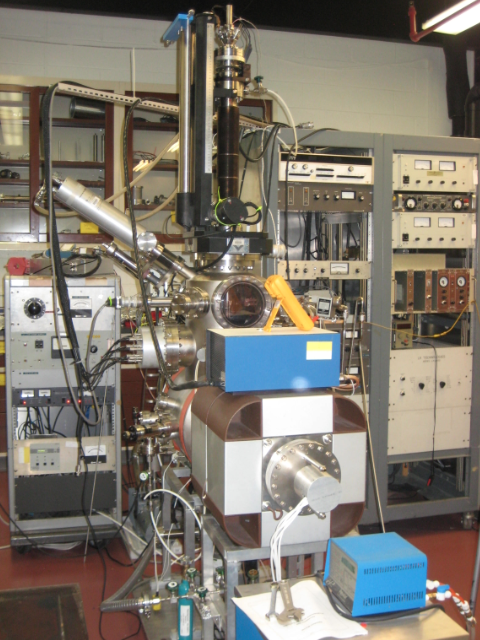 A differentially pumped ion gun used with the R3000 analyzer provides LEIS capability to determine elemental concentrations in the topmost atomic layer of samples, complementary to the near-surface concentration and chemical state information provided by HR-XPS.